Purpose: In this activity, you will be using a sample of ordinary poster board with uniform thickness to study area. Since the thickness is constant, you can measure the mass and area of rectangular poster board samples and graph the data to find a relationship between mass and area (mass/area). Using the graph, you will then be able to find the unknown area of an irregularly shaped sample of poster board. 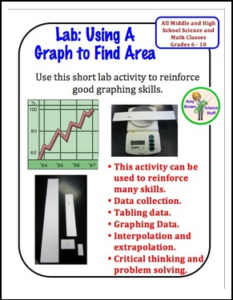 This is an activity that can be used to teach basic graphing skills as well as the use of basic pieces of lab equipment – the ruler and the balance. Materials needed: Balance, 4 samples of poster board of regular shape, 1 irregular sample, graph paper, ruler, pencil. This product is included in my Science Skills Mega-Bundle of 61 files. The bundle contains 61 different files on science skills, including metric system, scientific method, scientific notation, graphing, significant digits and more.